New Map of Boston compiled from the latest Surveys. Offered is an extremely scarce large format pocket map of Boston dating to 1870. This beautiful large format map depicts the whole of Boston as the Back Bay landfill neared completion. In fact, only a small part of the land fill, near Brookline, remained unfinished. 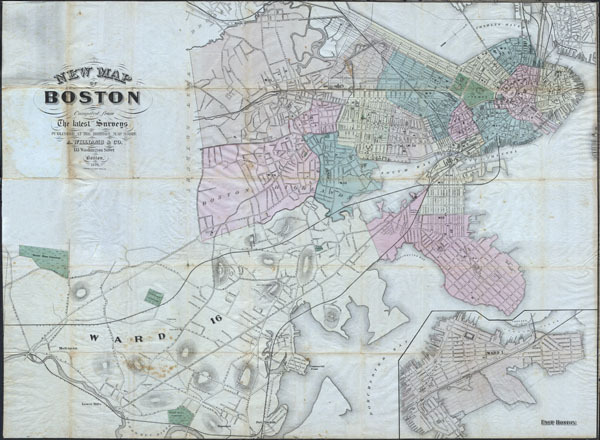 Includes and inset of East Boston in the bottom right hand corner. Published by the Boston based 'Boston Map Store.' Folds into its original booklet. . Very good condition. Partially restored and flattened. Attached to its original green linen binder. Minor repairs and discoloration along original fold-lines. Else clean.